Once again, Friday is here to close out the week and deliver us a piping-hot client feature blog! At the end of each week, we like to use the space on this very blog to give a shout out to one of our amazing clients from around the country. We feel so fortunate to work with some of the best dentists from all over, so it’s only right we show a little appreciation! This week’s client feature goes out to one of our dental clients who is hosting an awesome event today. Cleveland Family Dentistry is a dedicated team committed to providing quality care to Cleveland, TX. 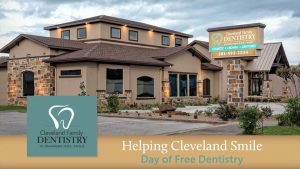 Cleveland Family Dentistry is on our minds today particularly because they’re hosting a Day of Free Dentistry at their practice right now! This is an awesome event that welcomes members of the community who can’t otherwise afford important dental procedures, like fillings and cleanings, to come receive care. The Cleveland team is constantly hosting and participating in community-oriented events that enrich the lives of local citizens. The fact is, most people will become introduced to your dental practice online before they ever set foot inside. That means that your online presence — your website and social media channels — need to accurately and positively represent you and your team. Cleveland Family Dentistry is all about a welcoming and comfortable care environment for patients, and that message is clearly communicated on the practice’s homepage. You want patients to feel good about their visit before they even arrive at your dental practice. Hosting special events at your practice, or sponsoring community events creates great opportunities for community outreach. When you’re seen as a visible member of the local community, people can put a face to your dental practice. This can help to break down the potential barriers to care (like dental anxiety) that some people face. Not all marketing efforts need to be direct sales pitches or special offers. Simply being a friendly face in the community can help you to bolster your reputation as a business. Making a positive first impression goes a long way toward securing a new patient at your practice, and that first impression is likely to happen online. MDPM Consulting can rebuild or redesign your website to give you the positive, welcoming image your practice deserves. Contact the MDPM Consulting team in Dallas, TX by calling the office at 972-781-8861.